Data Privacy Day is an international effort, held annually each January 28, to create awareness about the importance of respecting privacy, safeguarding data and enabling trust. All organizations (and individuals) share the responsibility of being conscientious stewards of personal information. Why Should You Care About Privacy? Today, we’re more connected than ever, thanks to the internet and the ability to carry our connected devices everywhere. More people than ever have access to computers, mobile phones, and even wearable personal devices or devices in our homes. However, many people don’t understand the tremendous amount of personal information that is collected, shared, and often sold. When you connect a device and provide personal information, the company can collect and monitor that information, and often use it to determine what you’re likely to buy. This isn’t necessarily bad – you’re going to be marketed to anyway – but you should understand how the information you share is collected, used, and shared. As a consumer, you should carefully consider what information you are sharing and be aware of its value. Personal info is like money – value it and protect it. Get familiar with the privacy settings on the apps and programs you use. Regularly review their permissions, keep them current, and delete those you don’t use. If you collect it, protect it. Follow reasonable security measures to keep individuals’ information safe from inappropriate and unauthorized access. Be open and honest about how you collect, use, and share the information you collect on your customers. Clearly communicate what privacy means to your organization and the steps you take to achieve and maintain privacy. 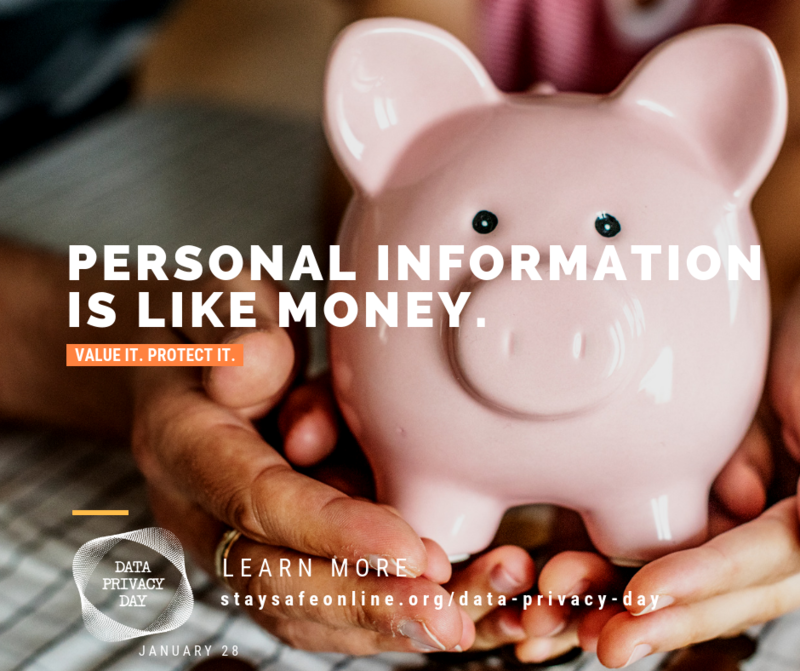 Visit StaySafeOnline.org and learn how you can get involved in Data Privacy Day.